Back in the days, India, specifically the region of Rajasthan, was filled with multiple tribes who were known by the work they did. One of those groups were the block printers. They used to create the printed clothing for the various tribes in the region. Each design, with various motifs, specified your job or the tribe you belonged to. You could tell whether a person was a farmer or Metal smith by the printed shirt or turban worn. The strict separation of the tribes has slowly dissipated but what remains are a few stories by the elder generation still keeping alive the secrets of the motif and the craft of block printing. To the artisans we work with, the Art of Block Printing is their tradition and their way of life, for the past four generations. It continues now to the latest generation that strives to keep the family craft alive by finding new markets and ways to keep up with fashion. The only thing that remains true is the beat of the wooden block on the table, the 20 year old and 10 ft deep indigo dye vat, and the passion to continue. HAVE YOU EVER WONDERED WHAT HAND BLOCK PRINTING REALLY IS? Hand Block Printing with natural or vegetable dyes is an ancient print technique. This art form has been around for years in India, and saw its most glorious years around the 12th Century. Today, it is competing against the fast world, but surviving due to the people who still value them. “BLOCK” means a wooden square piece with an engraved pattern on it. This block is used to print on fabric – and this art is called block printing. The fabric is then commonly called block print fabric. There are few different types of block printing. I have listed the process of "Dabu" printing below. Dabu is an ancient mud resist hand block printing technique. 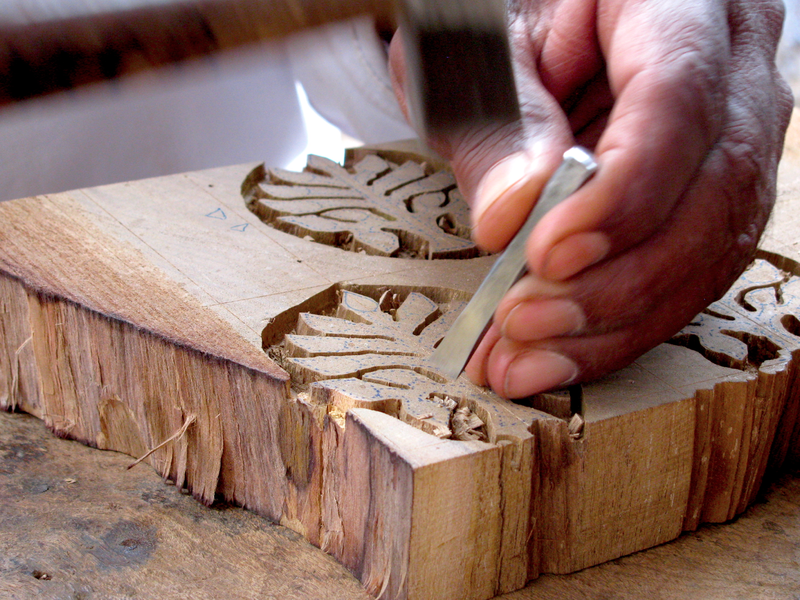 Master block carvers, who have been doing this for many years, carve these blocks. These blocks are carved by a chisel and wooden hammer to form a design pattern. There are a couple of block printing techniques but the one that we work with is called Dabu. Dabu is a mud resist made by mixing together fuller’s earth, gum and few other natural ingredients. It is mixed into a paste not by hand nor by machine, but by foot, just like grapes were crushed to make wine in the yesteryears! Once this paste is ready, the fabric is printed with a block using that resist. The areas that are stamped resist any dye that the fabric is dipped in. Sun is crucial to this process. At every step the fabrics have to dry in the open fields under the sun. Did you know, that most of this work comes to almost a stand still in the Monsoon seasons of July and August?! After the fabric has been printed, it gets dyed. We work with dyes that are made with natural materials found in our surroundings, such as flowers, leaves, spices and various other natural metals! Below is an indigo vat that has been going on for several years! After dyeing, the fabrics get washed by hand. More so than not, block printing is a multiple step process where the fabric gets re-printed, re-dyed to bring out the designs we want. And that sums up the process of block printing! Of course we stumble upon lot of problems as the color didn't come up right, or the print got messed up while printing or dyeing - but that's life - and we take it as it comes! Each time is filled with a lot of color and prints. Here are a few images of what went on behind the scenes from blocks, printing, dyeing, and finally the party! After our meeting with the artisans, we cooked and ate into the night. What is Fashion Revolution, you ask?